Let’s pop back over to Spain for a moment, Rioja is not the only game in town when it comes to the fruitful production of grapey goodness. Just a bit south of Rioja flows the Duero River, along which you can find a couple of Spain’s most well-known wine regions. Moving west to east, we start in Rueda, which is the region centered on the town of the same name, which is about 170 miles northwest of Madrid. Wine was produced here since at least the 11th century. Rueda is best known for white wines, particularly those produced from the Verdejo grape, which is native to the region. Some reds are produced in Rueda, but less than 5% of the total harvest yield is red grapes. Rueda whites are produced to be drunk relatively young, and are known to be quite food-friendly. Many wine lovers liken Rueda wines to sauvignon blanc, and that comparison certainly held up for the Torres 2015 “Verdeo” Verdejo which I had the opportunity to try. The Verdeo (and I’m unsure why the spelling is different) was a crisp, acidic quaff with aromas of pear and lemon that were mirrored on the palate. I found it to be a little richer than many sauvignon blanc, effecting a little bit of a glycerine sweetness on the palate and on the finish. It was pretty good as an aperitif, and I had the wild hair to try it with a pork and fennel Thai curry. It handled the pairing OK because of the slight sweetness at the end, but beer worked better, honestly. I think it would be a better match for fish or shellfish. Eighty or so miles down the Duero lies Ribera del Duero – the Spanish wine region which competes with and complements its neighbor to the northeast, Rioja, in the manner that Bordeaux and Burgundy eye each other. In this case, however, both of the Spanish regions focus on the same red grape, Tempranillo. The converse of Rueda, Ribera del Duero’s grape production is almost exclusively red. The nomenclature of the red wines – “Crianza,” “Reserva,” and “Gran Reserva” mirrors that found in Rioja. Ribera del Duero, which translates as “the banks of the Duero” is a very dry, hot region in the summer – receiving less than a foot and a half of rain annually. Also located on a high plateau, temperatures soar in the summer and can be brutally cold in the winter, so the vines must be quite hardy. Since they must struggle, the wines take on some very interesting characteristics, especially when compared to Rioja. Of late, production has increased in Ribera del Duero as the world discovers the differences. The sample of Torres 2013 “Celeste” Ribera del Duero Crianza provided an interesting contrast. The nose was fragrantly full of cherries and violet. I thought that the flavors of the RdD were deeper than the bright cherry flavors found in the Rioja Crianza that I tried. The mouthfeel was considerably chewier with some more pronounced oak flavors. There were dark fruits – blackberry and plum – on the palate, which finished up with some chewy, plummy tannins. I thought this was a pretty serious red, but not so big as to be overwhelming. It calls for grilled or roasted meats, especially beef. A NY strip was a lovely accompaniment. If you find the Duero-based wines interesting, there are a number of other wine regions along this plateau. Wines from Arribes, Arlanza, Cigales (especially for rosé), and Toro would provide you with some interesting contrasts. Yeah, I’m going to relish this one a little. One of the developments I’ve seen in the US wine market has been the greater demand for rosé. More domestic producers are sending out the pink product, spending their resource to create better versions. 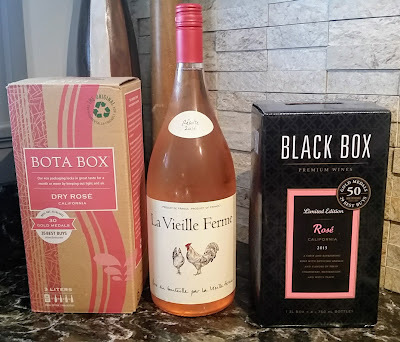 Rosé has finally differentiated itself in the market from White Zinfandel and other similarly syrupy sweet concoctions. One of the Vine’s continual quests is to get the wine drinkers of our great land to embrace the pink. Trying to buy a particular bottle of French rosé at Big Wine Store and being rebuffed by one of the employees on the floor is a significant part of our origin story. I think a good rosé is just about a perfect wine – refreshing and crisp, yet able to snuggle up alongside various dishes and cuisines. So when a news release came across the transom indicating that a rosé was now the #1 selling French wine in America, I couldn’t help but smile. The wine in question was Whispering Angel from Château d’Esclans, which sold 200,000 cases of the stuff in 2016. They first entered the market in 2006 (the Vine’s inaugural year), when they were pleased to just crack the 5,000 case mark. Château d’Esclans is in the Côtes de Provence growing region, the classical center of French rosé production (although the good folks in the Tavel region of the Rhone valley might question that designation). The Côtes de Provence produces 75% of all wine in Provence, with 80% of that being rosé. The main grapes used in Provence rosé are Grenache, Cinsault, and Mourvedre. As a quick review, rosé is produced using two methods, often in combination. The first is the maceration method – in which red grapes (such as those mentioned above) are crushed and the juice remains in contact with the skins for a brief amount of time – from a couple of hours to a day. The longer the skin contact time, the darker the color and deeper the flavor. The resulting pink product is then fermented into rosé. The second method is called saignee or “bleeding.” In this method, a producer making a red wine will “bleed off” some of the macerating juice after a certain period of time to further concentrate the flavors and tannins in the remaining red wine-to-be. The pink-hued bled-off juice, once discarded as an afterthought (especially among red wine producers in the US) is then fermented into perfectly good rosé. At least 20% of the blend in a wine from the Côtes de Provence must be produced via saignee. 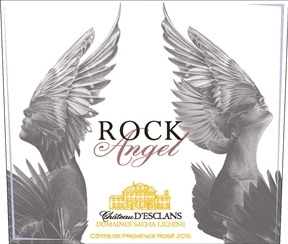 I had the opportunity to try the Whispering Angel 2015 Côtes de Provence Rosé side-by-side with its higher end cousin from Château d’Esclans, the Rock Angel 2015 Côtes de Provence Rose. Most wines are crafted for a certain context. Winemakers, through grape selection, vinification, and aging, determine whether a bottle will be a simple, straightforward sipping wine, a flexible-but-uncomplicated table wine, or something richer and more complex. Rather than a lean, stony, somewhat citrusy sipper, the Rock Angel has a lot going on – a complexity that I expect out of pricier reds and whites from Burgundy. Strawberries, herbs, and oranges are some of the flavors I found, along with an interesting creaminess layered atop the mineral backbone. I’d not tasted a rosé built quite like this one. This was a rosé you could open with richer preparations of chicken, fish, or salads and not fear it being run over by flavor. I had to tell myself to slow down and appreciate this wine, as I tend to drink rosé a little too quickly. So, what the catch with all this deliciousness? While the consumption of French rosé has increased, wineries followed the logical economy and raised prices. Five years ago, a bottle of Provence rosé was rarely more than $10-12. The Whispering Angel usually retails for $22, although I found my bottle for $18. The Rock Angel runs around $30-35. And Château d’Esclans makes two other, more expensive versions – the most expensive retailing at around $100. I can’t imagine what that wine would be like (although I’d certainly love to find out).